For over 20 years Charlie & Ruth Jones were a touring theater company which traveled nationally and internationally to hundreds of stages and thousands of audience members. 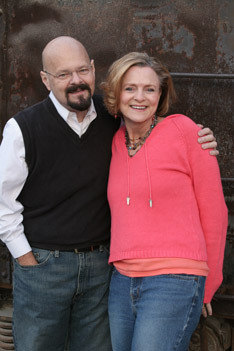 Writing original material, this dynamic couple brings laughter and inspiration together in hundreds of clever plays. But after 20 years on the road, they were looking to settle down and were led to Greensboro, NC. Since that time life has been completely different and completely wonderful as they have invited community into their lives and home. This wonderful transition brought City 616 into existence. Since graduation from Wheaton College with a degree in philosophy in 2013, Darren has spent time traveling and being involved in various ministries. His main inspirations for the vision of the Art House Fellows have been the time he spent at L’abri in Boston and in the Greensboro Fellows program. Some of his in interests include phenomenology, the philosophy of science, the philosophy of mind, aesthetics and Eastern Orthodox Spirituality.